Hiya guys! You wouldn't believe the incredibly frustrating weekend I had with this blog post. I ended up losing the entire written post twice and had it re-write the whole thing. It was like I was stuck in every bloggers worst nightmare! But finally here we are and I can share the beautiful Juicy Jewels Collection from Tux Polish. Fairing warning, this is a photo intensive post! Also be prepared to drool as these are so gorgeous, haha. 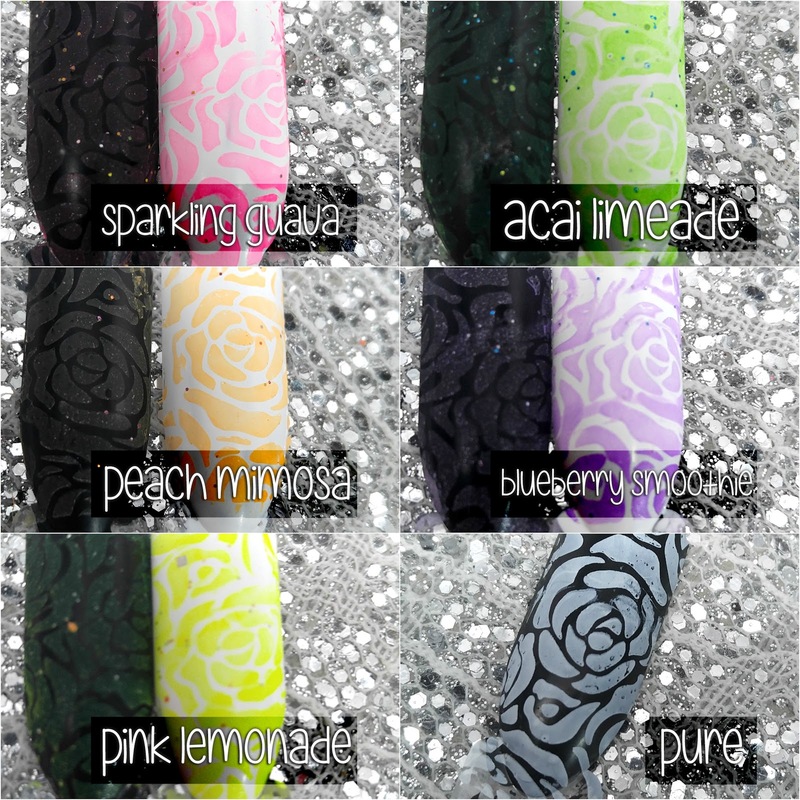 The Juicy Jewels Collection by Tux Polish is now available for purchase individually and as a whole set. Each full-size bottle (10mL) retails for $9.50 ($8.50 while on sale). For the complete set you have the option to purchase with Pure (white cream) for $63.00 ($59.00 while on sale) or without it for $57.00 ($51.00 on sale). 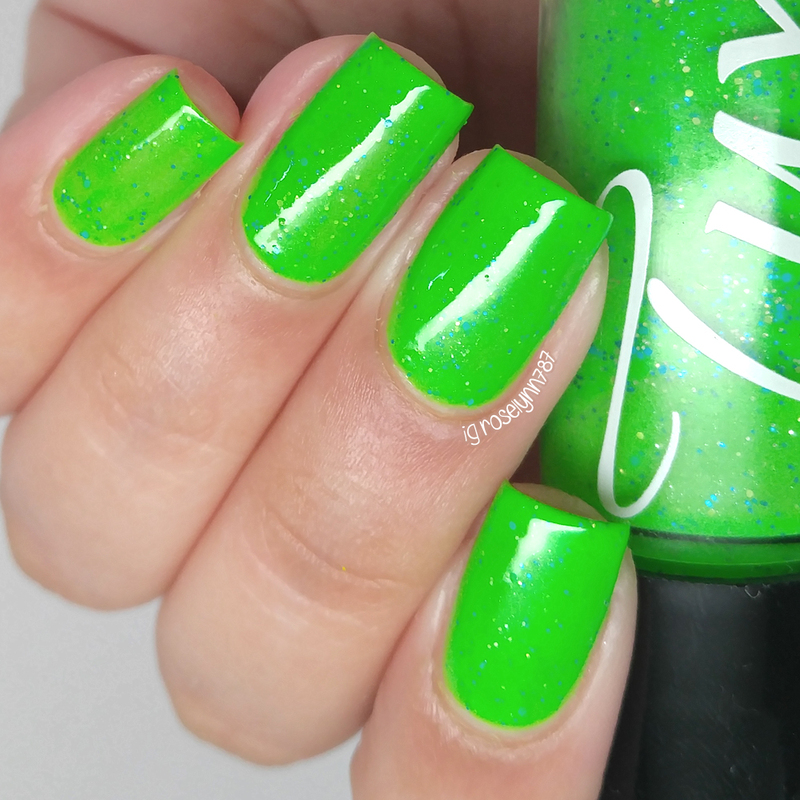 Acai Limeade can be described as a lime green crelly base with shimmer, blue glitter, and silver holo glitter. 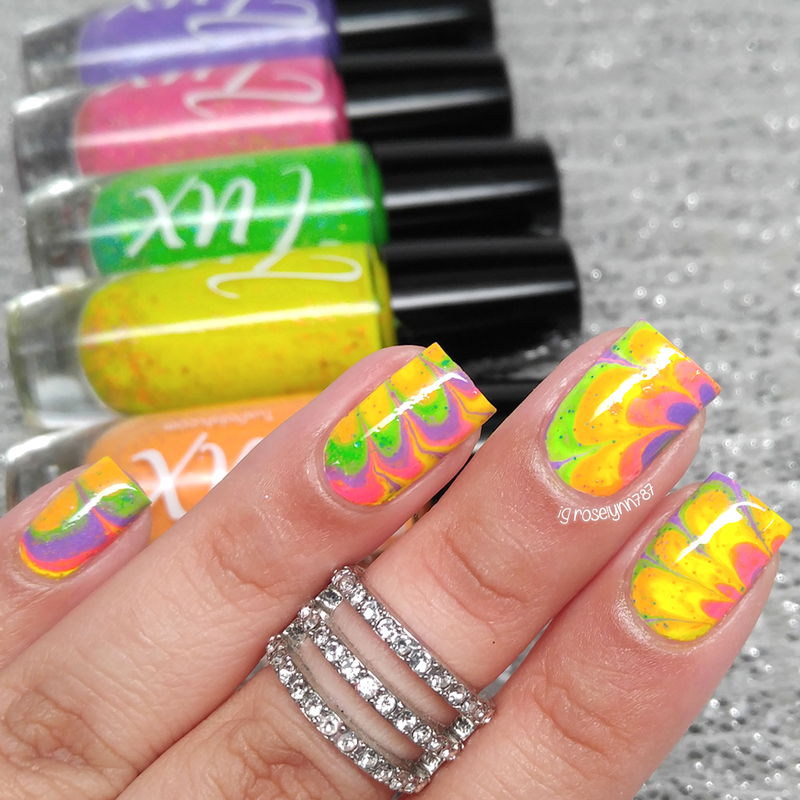 The neon base is so intense, I got nothing but compliments all weekend long while wearing it. In this case, the macro definitely shows it more true to color. The formula has a smooth application with perfect glitter distribution per brush stroke. Shown in two coats and sealed with a glossy topcoat. Sparkling Guava can be described as a pink crelly base with shimmer and holo glitter. Shown in two coats and sealed with a glossy topcoat. 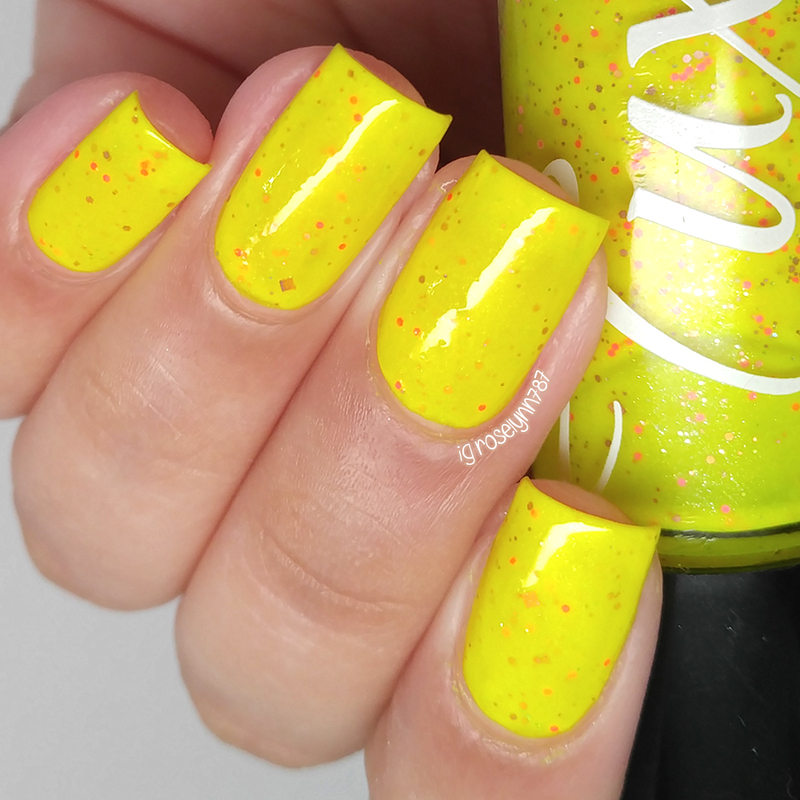 Pink Lemonade can be described as a neon yellow crelly base with shimmer and pink glitter and pink holo glitter. Shown in three coats and sealed with a glossy topcoat. Peach Mimosa can be described peachy-orange crelly base with shimmer and pink holo glitter. Shown in two coats and sealed with a glossy topcoat. Blueberry Smoothie can be described as a blurple crelly base with shimmer, flakies, and some blue and silver holo glitter. Shown in two coats and sealed with a glossy topcoat. Pure can be described as a pure white creme. New favorite white cream alert! Every nail artist is always on the search for the perfect one coater and this one definitely comes close. The formula has a great consistency, not too thick or too thin. Shown in two coats and sealed with a glossy topcoat. 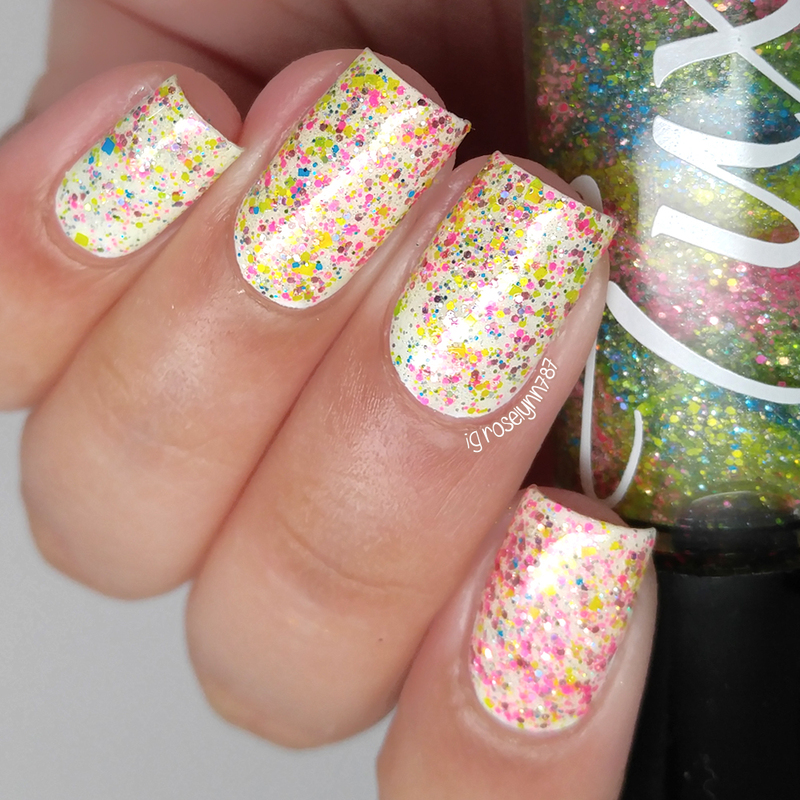 Unicorn can be described as a layered neon-rainbow glitter topper in a white-capped bottle. Each color layer has lots of holographic sparkle with multiple types of glitter. And the best part is you can actually customize your own by letting Tux Polish know the order of the neon-rainbow colors! Now can you believe this swatch is one coat non-dabbed?! Yes, all this glitter in such brush stroke and you get so many of the colors too. Especially by the time I got to my pinky nail the colors were really starting to blend. Shown in one coat over Pure and sealed with a glossy topcoat. Also if you follow me on Instagram then you can see a photo of the bottle posted a few weeks ago. This was taken right when the polish was delivered and the layering of the glitters was still intact. Barely any blending whatsoever so it's definitely nice to know that it upholds shipping so well. Berry Cherry can be described as a berry purple jelly polish with silver holo, red holo glitter, and scattered larger purple glitters. This shade was created as the current Customer Appreciation Polish and is available at a very special discounted price for a limited time. The formula is a little on the thick side due to the immense amount of glitters in the finish. But there is no need to fish because the glitter payoff is spot-on. It ends up drying to a gritty finish, so I doubled the topcoat to smooth it down. Shown here is two coats sealed with a double layer of topcoat. Polish Nectar is a brand new product over at Tux Polish! It's a nail polish conditioner that can be used to adjust the consistency and increase the blending of your Unicorn polish over time. It can also be used with any polish as well. Hands down the biggest appeal factor of this collection is the fact that these are crelly polishes that can watermarble! The glitters mixed in add such a fun and cute factor to this look. I'll definitely be doing a different post with a tutorial and more photos on this. As you guys can see above these do stamp fantastic against a white base, however, not so well against black base. The shades don't seem to be pigmented enough to show brightly against the darker base color. Except for Pure, which is hands down now my go-to white for stamping and nail art. 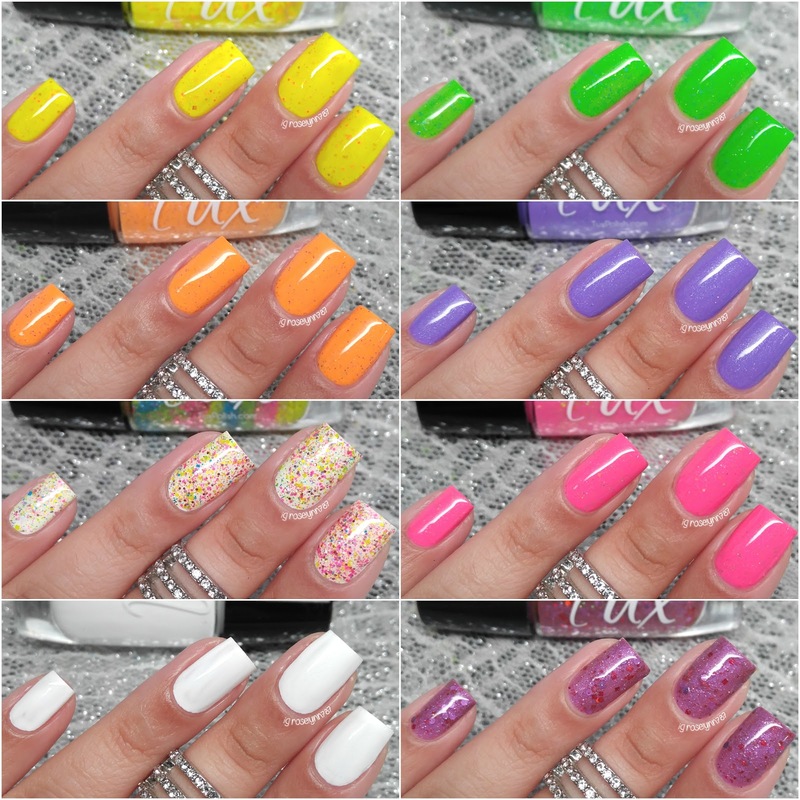 Overall this is to-date my favorite collection from Tux Polish - even trumping the last collection of pure neon cremes! I swatched all the crellies on their own, but they can be layered over Pure to make the color 'pop' more. As I mentioned before, I am SO impressed with how well these watermarble. Honestly the formula as a whole is perfection among the five crelly with spot-on consistency. Are you guys as impressed with these as I am? Will you be picking up the Juicy Jewels Collection for yourself? I'd love to hear what you think of them! To recap, the Juicy Jewels Collection by Tux Polish is now available for purchase individually and as a whole set. 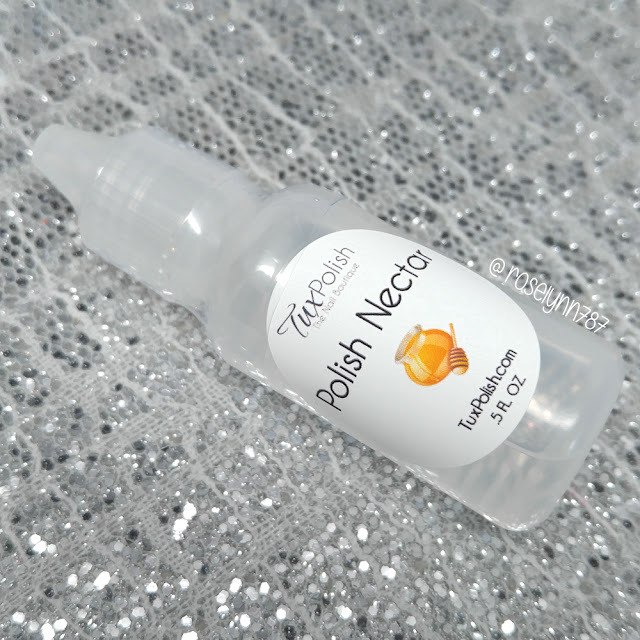 Each full-size bottle (10mL) retails for $9.50 ($8.50 while on sale). For the complete set you have the option to purchase with Pure (white cream) for $63.00 ($59.00 while on sale) or without it for $57.00 ($51.00 on sale). Did you have to layer these over the white or are your (gorgeous) swatches sans undies? These are so bright! It's lovely that they stamp and watermarble too! Thank goodness the post did not eat your pics! I love that these both watermarble and stamp - it's so fun when glitters do that.